Our star three-year-olds Tivaci and Tulsa did not have much luck in their respective Guineas races on the weekend but the carnival continues and we march on! And we look forward to seeing what both young horses can progress to from hereon. Meanwhile we have four midweek runners kicking off with debutant But It's True at Warrnambool on Tuesday. A son of High Chaparral and the stakes winning Align mare Pennacchio, the three-year-old jumps from barrier two in the 1300m Maiden Plate with Jamie Mott aboard. 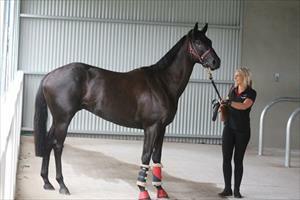 "He is a really lovely horse," Michael Moroney said. "He has taken a bit of making but all of a sudden he has been showing us something. He won a jump-out at Werribee and did everything right though he has still been green at home." "But he does have ability and he should run well first up." We have three runners at Bendigo on Wednesday, the first of which is Geodesic who has finished off nicely at his first couple of starts. Suited up to 1600m with blinkers added, the handsome son of Domesday has always shown ability but is still learning, racing greenly at debut and getting a bit lost in a spaced out field second up. "Jake (Noonan) said that he just wasn't sure of himself when the field strung out and he was left to do the chasing. He still has a bit to figure out but he is a nice horse in the making." Later in the day we have Our Valdivia back to the mile in the BM70 Handicap and he looks nicely placed with Ben Allen aboard. "He should've won last time out and the horse who beat him - Adirondack - won again in Adelaide last Saturday so the form is good." "He is in the right form to win." In the following race we have Cape Londonderry contesting the 1400m BM64 event with Jake Noonan to ride. Having his first run since a Wangaratta victory in early December, the Pentire three-year-old is being aimed at the South Australian Derby but is expected to sprint well fresh. "He can run a cheeky race though of course he will improve on whatever he shows first up," Moroney said.